The global import market was worth $15.6 trillion in 2015. See where goods came from and where they went. International trade can be a bit of an abstract concept, but this map will help put your next trip to the mall or grocery store in a global context. 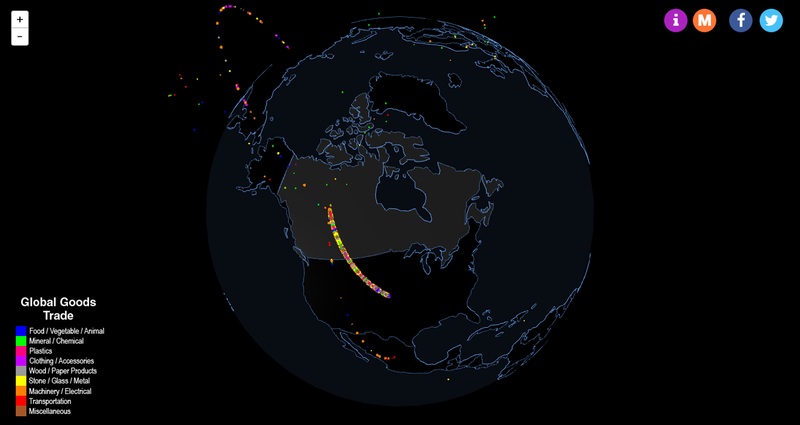 Created by Max Galka of data visualization blog Metrocosm, it lets you spin the globe to see where goods came from and where they went in 2015, according to the UN's Comtrade database. The dots are colour-coded to correspond to different categories of goods (food, clothing, natural resources, etc. ), and each dot represents $1 billion in value. Here's a gif of the map in action, highlighting China's enormous contribution to the world's import market. "With the election of Donald Trump, international trade is suddenly at the top of the U.S. agenda," writes Galka, "and it occurred to me, I actually have very little idea what the big picture of foreign trade looks like." Trump came to power in part on a promise to re-evaluate America's trade relationships and has vowed to renegotiate or even withdraw from the North American Free Trade Agreement (NAFTA), though what that will mean in practice for its biggest trading partners remains to be seen. In the meantime, follow the dots around Galka's globe and let us know in the comments about what insights you gain.